"The internet...has allowed for an explosion of learning opportunities"
"students must learn to identify and appraise resources"
The internet provides a resource for information that is unparalleled in all of human history. This has allowed for an explosion in learning opportunities worldwide as more regions and communities are connected to the network. They have immediate access to a wealth of free knowledge that would have been unthinkable in many places just a few years ago. However, along with this windfall of quality resources comes a plethora of misleading or outright false information. This has become a major concern at every level of society and therefore students must learn how and practice identifying and appraising the quality and credibility of data and resources that they find online whether for educational or personal use. 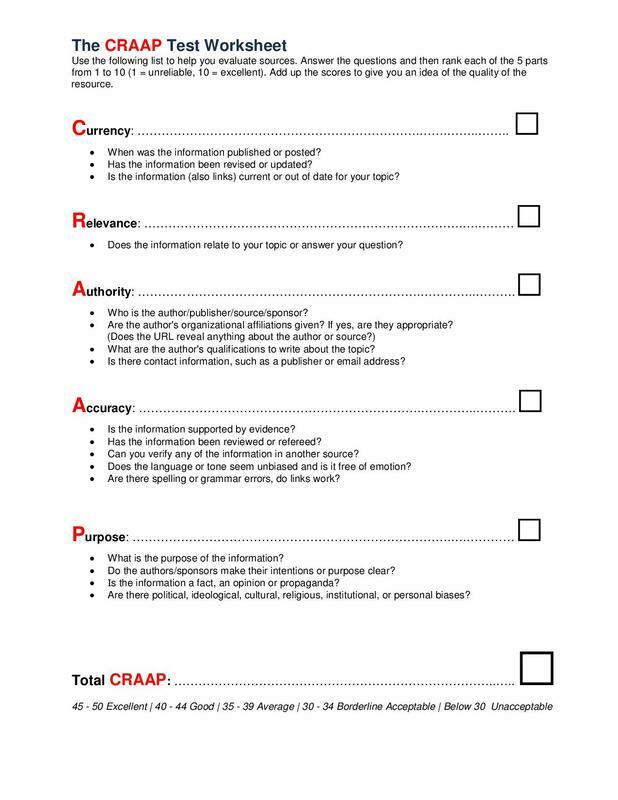 The following "CRAAP Test Worksheet" is a resource to help the students maintain a safe digital research environment and evaluate the credibility of online resources. Below the worksheet there is a link to a "Website Evaluation Wizard" to help evaluate the authenticity of a web page, and an example JIT lesson for teaching how to determine source credibility. 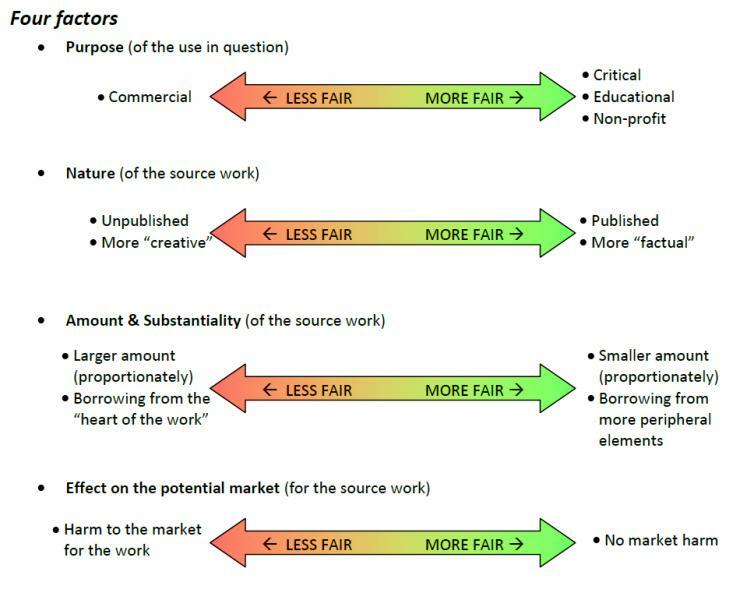 Several graphic resources follow the example JIT lesson below which display the important points about copyright, creative commons and "fair use" to aid in using media resources found online for educational purposes while being aware of the factors concerning copyright and fair use policy and law. Click the button below for a tool to help quickly evaluate the authenticity of a web page. Several criteria can be evaluated and a "red flag" will be given if one or more of the criteria suggest that the page or it's contents should not be trusted. The following is an example of a JIT to address the types of online research typical to a secondary level science curriculum. The question is designed to be provocative, open ended and allow an opportunity for students to “take a stand and justify their position” (Novak, 2014). Write a short explanation of your own assessment of the claims made by the websites’ authors and then compare that with the score from the CRAAP Worksheet, and write any comments. Find and note one online source refuting the claims of these given sources or giving an alternative perspective. What kind of scientific knowledge do you need to understand and assess the information in these websites? How can you be sure that scientific information you find online is truthful, unbiased and useful? The International Society for Technology in Education (ISTE) has developed standards to guide instruction for effective use of technology. Below is a poster showing the standards for students, for more details about each standard, visit their website. The JIT lesson above was created to initiate critical thinking about researching online in a safe way while being aware of the factors which intimate source credibility. 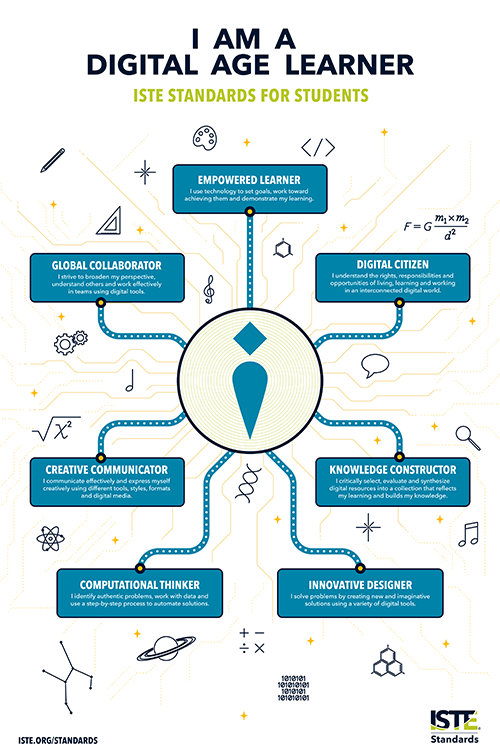 It addresses several of the ISTE standards relating to becoming a “Knowledge Constructor” ​(ISTE Standards for students, 2017). The example JIT lesson above requires the students to use critical thinking skills to determine the credibility of the sources and the validity or bias of the information presented. They must also locate a relevant source to refute or challenge the given sources requiring them to “employ effective research strategies”. Finally, they will “build knowledge” about “real-world issues” by working to understand the concepts involved and discovering the facts about the matter (ISTE Standards for students, 2017). These are several important skills found in the standards. We should also consider bias or different perspectives that the authors of online content may hold. Here is a good explanation of bias and how to detect it. And this is a tool to help with formulating a perspective and synthesizing sources to support that claim (helpful for writing papers). 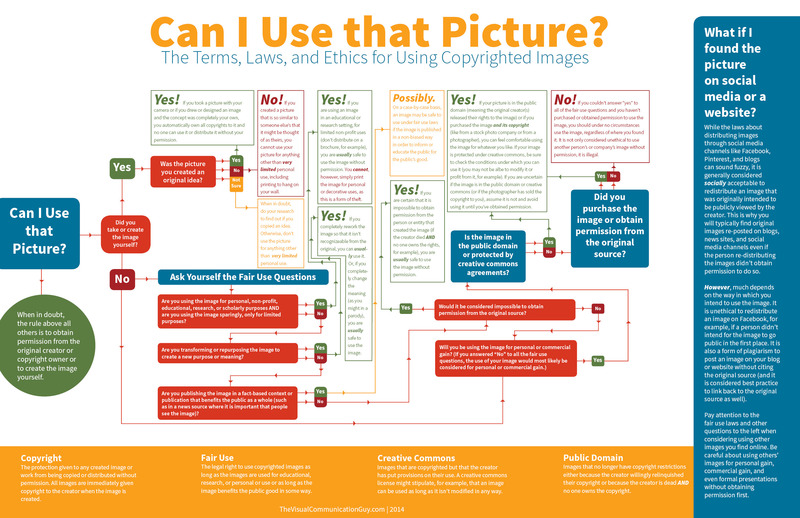 Here are several infographics and charts that can help students determine whether or not a resource can be used for a particular purpose. They can also help to decide what type of protections or licensing the students' own work requires. This is a comprehensive infographic flow chart that can help to determine whether or not a resource can be used for a particular purpose. The full image can be downloaded below. 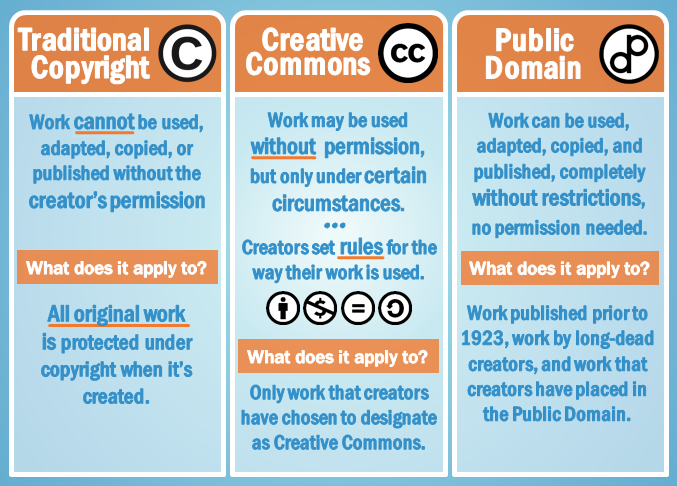 Use this chart to get a general idea of different protections and permissions. 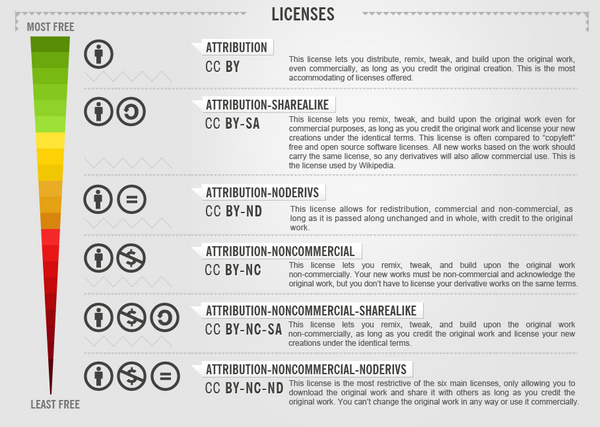 Use this chart to understand the various Creative Commons Licenses. Continue to Section Three for information about Hacking and Education and also how to protect your Online Privacy and manage your Digital Footprints.